Venice is full of beautiful shops, full of beautiful things to buy. With a student budget, however, sometimes a little bit of window shopping has to do. Here are a few of my favourite shop windows, you may notice a distinct lack of mask and glass window shops! I think I must have passed so many, that they stopped catching my eye! Next time I make it out to Venice, I will have to correct this! 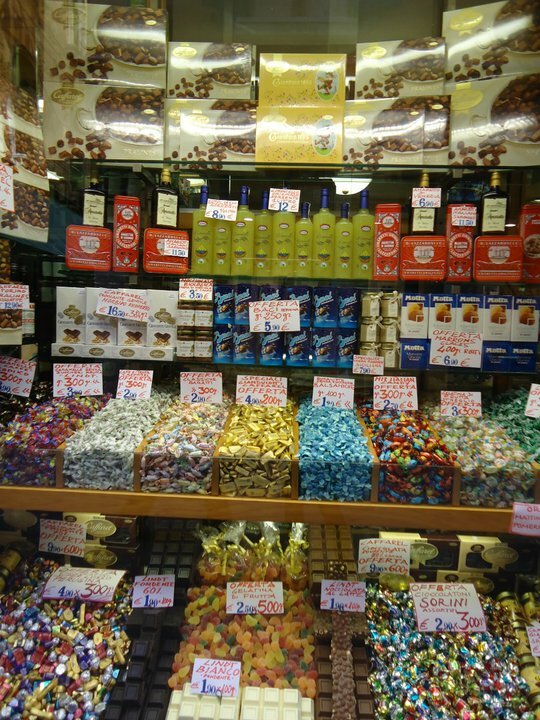 This shop window can be found just off the famous Rialto Fish market. 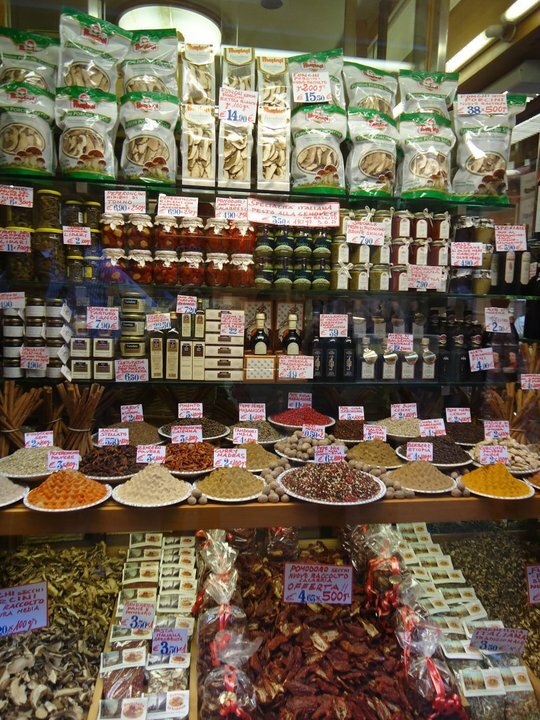 Wonderful herbs, spices and dried vegetables and fruit tempt you inside. Buy some spicy Italian sausage, fresh vegetables from the Rialto market and some dried chillies, tomatoes and mushrooms from here and make a delicious casserole. Not so healthy as the previous window display, but just as tempting! This window is only next door from the shop selling spices and dried vegetables. Filled with a selection of sweets that would make Willy Wonka jealous, this shop is worth a visit just to gaze at the beautifully wrapped sweets and huge chunks of chocolate. Be warned, you can easily spend more than you ever wanted to on these blocks of chocolate. Venice is definitely a city of art. Famous galleries from the Accademia to the Peggy Guggenheim attract thousands of tourist, year in year out. 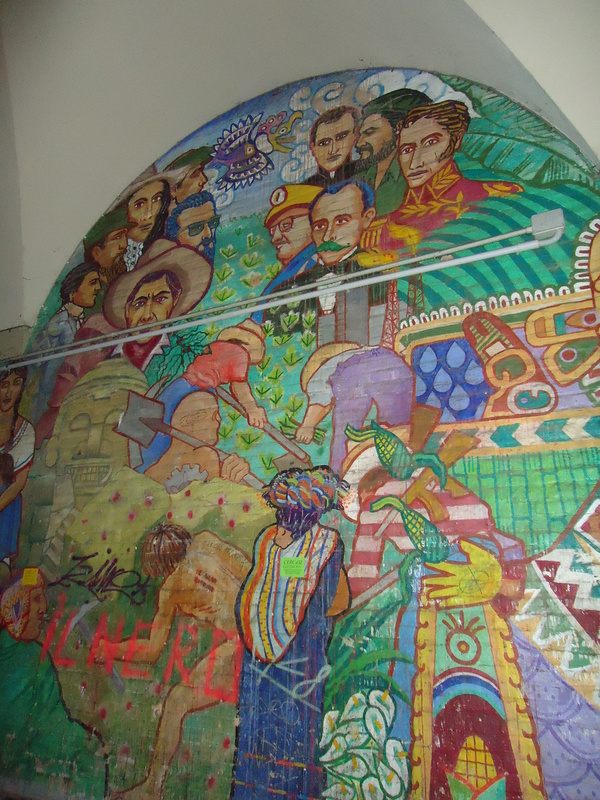 Smaller galleries and art shops are also well represented in the city. It is therefore no surprise that shops, favoured by artists also feature heavily in Venice. 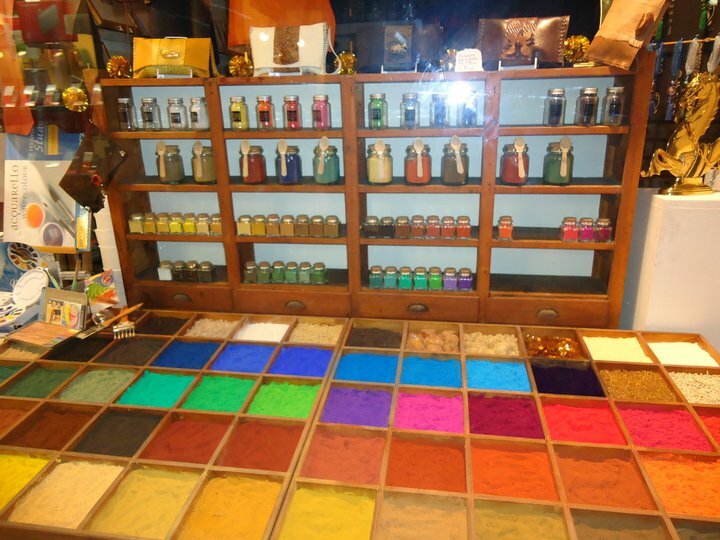 I loved the beautiful colours of all the paint powders. This photo really doesn’t do them justice. Streghe Benvenute! 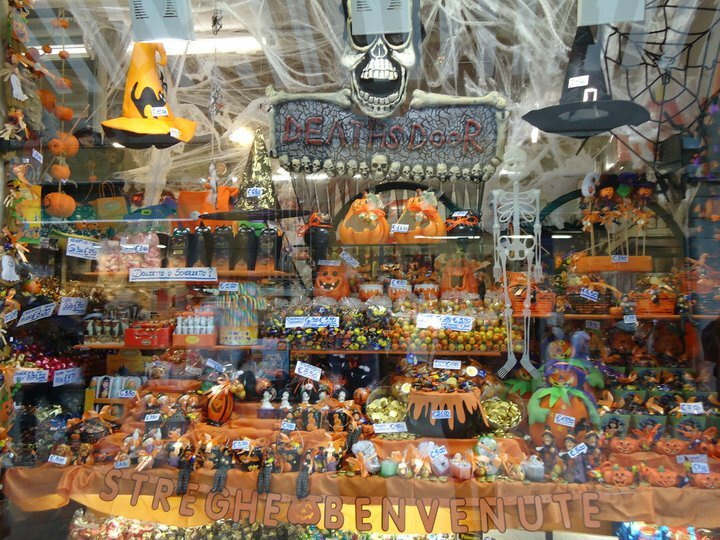 Halloween isn’t widely celebrated in Venice, but this sweet shop would always have beautiful window displays without fail. The shop is located on the Strada Nova and if you walk past early in the morning, there is a chance you will see the lady who runs the shop, carefully changing and redesigning the display. Autumn saw a display of cuddly squirrels surrounded by Lindt shaped chocolate nuts and paper leafs. Christmas saw a spectacular display of white, silver and red wrapped sweets. Venice’s Christmas decorations are understated and simple. Pretty, white fairy lights brighten up the occasional narrow street. 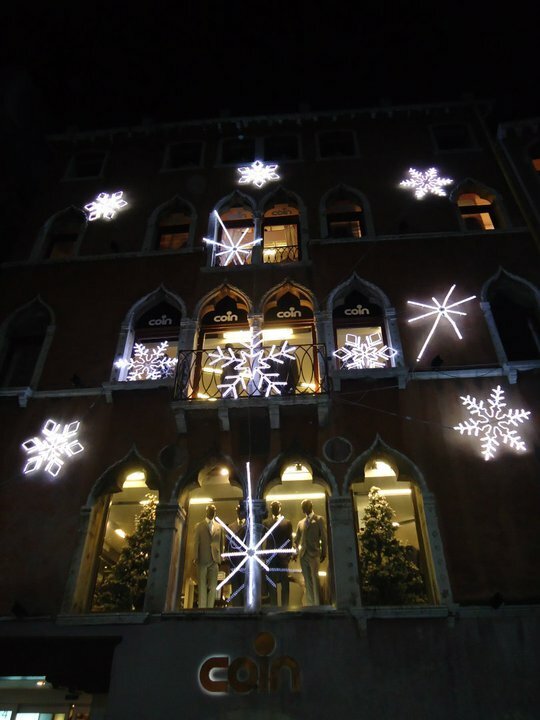 A projection of falling snowflakes graces the sides of the Campanile in Saint Mark’s Square. Coin, however, takes full of advantage of the festive season. 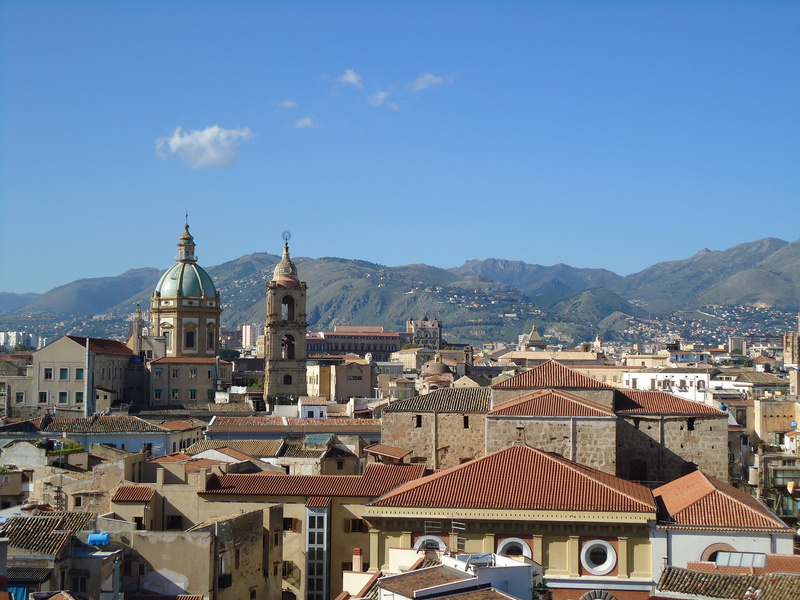 Coin is Italy’s department store and is great fun to explore, especially at the run up to Christmas. Trees covered in fake snow welcome shoppers in. Bright, white snow flakes fall decorate the outside of the building. You couldn’t help but get excited for the festive season as these went up! 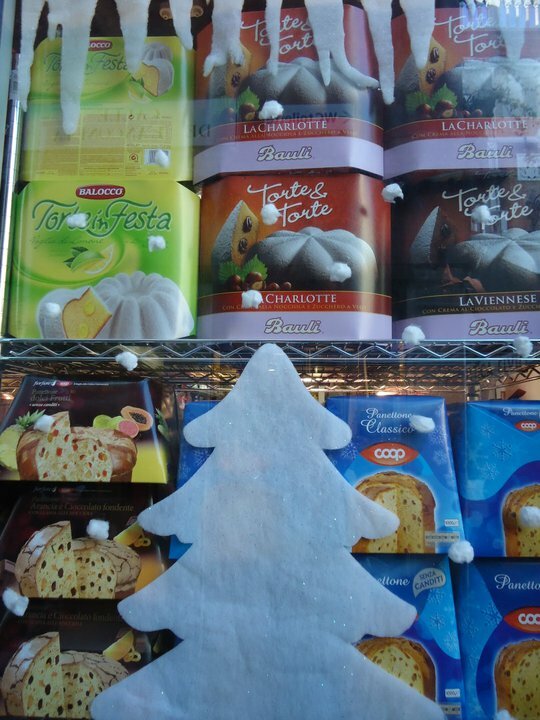 Venice’s supermarkets are known for their displays, but I couldn’t help but smile at this display in the window of a small COOP along the Strada Nova. Near Christmas time, Panettone are everywhere! I was horrified to discover that my Italian teacher had never tried, or even heard of a mince pie. However, a slice of Panettone with a cup of tea gives even the best mince pie a run for its money!